Our Challenge “Advance” Paper Cutter (Serial #13741)(1) has a nameplate giving the company’s location as “Grand Haven, Mich.,and Chicago, Ill.” This suggests that it was assembled after 1903, when the company moved to Grand Haven (2). The design, however, is somewhat older, as is suggested by the graceful curve of the yoke and the I-beam sections of the legs and other frame members. Our “Advance” is almost identical with “Reliance” guillotines manufactured in Chicago by Paul Schniedewend & Co. before 1893, including one in the Briar Press collection (3). According to the Challenge Machine Company’s current website (4) the firm was founded as Schniedewend & Lee in 1870, burned out by the Great Chicago Fire in 1871, built its first paper cutter factory in 1887, and changed its name to Challenge in 1893. It is not clear when in this sequence the company was “Paul Schniedewend & Co.” However, it does seem most likely that many of the same wooden casting patterns were used for “Reliance” and “Advance” guillotines of the same size, and that they were made in the 1880s (5). There is one further complication: in our example, “[?]. M. RECD. JUL. 23, 1889” is stamped into the casting near the serial number. It is not clear why one machine would have both this example-specific date and a post-1903 nameplate, but two possibilities come to mind. First, our guillotine may have been made and shipped in 1889, then received a factory rebuild sometime after 1903, getting the nameplate when it was rebuilt. Second, our guillotine may have been cannibalized from two examples of the same model, with the blade holder coming from an earlier example than the frame. remarked that I had been surprised at not finding the direct-acting paper cutter in use in England, when in America they had almost entirely superseded the plane or bookbinder’s trimmer for all paper trimmed and put up at the mills. He understood that there were very serious objections to them, inasmuch as a chisel-edged knife could not be thrust directly down through paper, without turning or making a sharp edge on the lower side of every sheet. Yes, I replied, if the paper is loose, but the pile of paper to be trimmed being pressed tightly together, the knife goes through it like shaving wood, and added, you can try with a sharp chisel, when you have the paper pressed on a calender roll shaft, ready for the lathe. He had never thought of this, but should certainly try it. He then asked if I would, for a consideration, sketch the most approved plan in use. Or, at least, so Sellers remembered the conversation half a century later. Little more information can be recovered about this original guillotine patent. In 1836 the U.S. Patent Office burned down, completely destroying all records of the 10,000 patents granted in the forty years since the system was started. Where there was enough information, pre-1836 patents were reissued; but only 2,845 were recoverable. The guillotine patent seems to be among the ones that were not reissued. Before the fire, published lists of patents gave a one-line description of the nature of the invention, the inventor’s name and residence, and the date the patent was issued, but no further information. 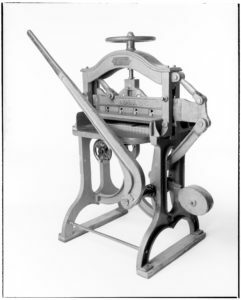 We have identified four such entries from before 1832, when Sellers described the guillotine as in common use; any of these might be the original bookbinders’ guillotine (the common term among binders for what manufacturers and printers vaguely call a “paper cutter”) but might equally be a reciprocating vertical plough, another idea that was in the air at the time. The likeliest is McClintock & Faber’s patent of 1825, early enough for the idea to spread before 1832 and from Sellers’ home state of Pennsylvania; but the others cannot be ruled out. A patent model of 1834, now in the Smithsonian Institution but in storage with the rest of its graphic arts collection, apparently shows a refinement to the basic guillotine; this is the earliest surving example. Frederick Austin’s patent of 1841 is for the lateral movement of the guillotine blade, which makes cutting more efficient; lateral movement is a key feature of the later guillotine. Through the middle nineteenth century the guillotine was crucial in preparing multi-signature cloth case bindings, but in the hands of the papermaker (7) and printer, not the binder. Paper could now be trimmed to exact size at the mill or in the printshop, and this allowed the binder to prepare cases to a precise, predictable size even though the head and tail were still merely folded— “unopened” in careful antiquarian book dealers’ parlance, or “uncut” in common usage (8). The first reader was expected to slit the folds at head and fore-edge with a paper-knife. In the bindery the guillotine was initially used for pamphlets, edition endpapers, and other routine tasks. In the last third of the century multi-edge guillotines (able to cut several edges without reclamping), gauges (which spread the cost of one set-up over the entire edition (9)), power, and other enhancements to the guillotine brought the cost of trimming an edition down to where it became an economic option. However, the plain guillotine has stayed in use to this day for short runs and miscellaneous tasks. Bookbinders’ Cutting Presses. John J. Wells, Hartford, Conn. March 28, 1824. Paper, cutting machine….Francis B. Howell….Loockport, Ohio….May 21, 1830. Paper, cutting machine….John Shugert….Quincy, Pa….Dec. 14, 1830. Paper, books, &c., machine for cutting….Joseph Woodhouse….Otsego, N.Y…..May 30, 1835. #2,134, June 16, 1841. “Machine for Cutting Paper and Trimming Books.” Frederick J. Austin of New York. Paper, cutting and trimming the edges….Jonas Bateman….Harvard, Mass….Mar.12, 1834. Paper, cutting and trimming in the ream….John Ames….Springfield, Mass….Feb. 28, 1834. Paper, cutting in sheets….John Ames….Springfield, Mass….Feb. 28, 1834. Burke, Edmund, compiler. List of Patents for Inventions and Designs, Issued by the United States. From 1790 to 1847….Compiled and published under the direction of Edmund Burke, Commissioner of Patents.Washington: J. & G.S. Gideon, 1847. Elliot, William. The Patentee’s Manual: containing a list of patents granted in the United States for the encouragement of arts and sciences… 1790 to 1830. Washington: S.A. Elliot, 1830. Harris, Elizabeth M. Patent Models in the Graphic Arts Collection. Washington:The National Museum of American History, Smithsonian Institution, 1997. Hawke, David Freeman. Nuts and Bolts of the Past: A History of American Technology, 1776-1860.New York: Harper & Row, 1988. Middleton, Bernard. A History of English Craft Bookbinding Technique.4th. ed. Wilmington, Delaware: Oak Knoll Press; and London: The British Library, 1996. Sellers, George Escol. Early Engineering Reminiscences (1815-1840), ed. Eugene S. Ferguson. Washington:Smithsonian Institution, 1965. We are indebted to the librarians of the San Francisco Public Library Government Documents Department for assistance in investigating early American patents and for bringing Burke’s List to our attention. (1) The serial number is on a flat area on the top edge of the blade holder, near the center of the part but resting to the right of the main screw when the blade is in the raised position. It is stamped directly on the cast iron, and is surprisingly hard to find, especially when the machine has been repainted (as ours has). (2) See Comparato p. 114, and the History section of the Challenge company website (http://www.challengemachinery.com/history1.htm). (3) See http:// briarpress.org/606#comments. The main functional difference between the Briar Press’s “Reliance” and our “Advance” is that the “Reliance” has a side guide on the left only, the “Advance” on both left and right. There are other small differences, for instance the point of attachment of the egg-shaped counterweight. Perhaps most striking is the Briar Press example’s small separate base, clearly factory-made for it, to raise it to convenient working height; but this base may be present because it is a smaller model, with a 16-1/2″ blade, than our 25″ model. rather than being a difference between the “Reliance” line and the “Advance” line (both of which were made in various blade lengths.) In general, most of the frame and many parts seems so similar (judging from photographs) that only the different sizes of the two examples show that they were cast from different wooden patterns. (5) It is also possible that the patterns were originally made and used by an independent foundry while remaining the property of Schniedewend, before being transferred to the new factory in 1887; in this case, they might even predate the Great Chicago Fire of 1871. (6) Sellers p. 119-121. Sellers (1808-1899) wrote various recollections of his youth as a machinist and engineer as a series of articles, mostly published sporadically in American Machinist magazine from 1884 to 1893. Eugene S. Ferguson gathered these and published them with short commentaries on various episodes. We first became aware of this wonderful source from Hawke p. 171-172. Donkin must have kept the idea to himself, because in 1840 one G. Wilson succeeded in taking out a British patent for the guillotine; see Middleton p. 224. (8)The 1852 description of Lippincott’s bindery describes the plough since “In leather bindings, such as in Bibles and prayer-books, the edges, instead of being trimmed with a knife, as before described, are cut through with a plough, so that there is no necessity for cutting the book open before reading it.” Interpretation of this sentence is tricky since the “before described” trimming of the edges with a knife is not to be found in the article; but “cutting the book open before reading it” seems to refer to the use of a paper-knife by the purchaser immediately before or while reading the book. See: C.T. Hinckley, “Everyday Actualities– No. VI. A Day at the Bookbindery of Lippincott, Grambo, & Co.” Godey’s Lady’s Book,November, 1852, pp. 402-412. (9) When set-up time is included, the time for cutting just one edge carefully with a guillotine is only slightly faster than with a plough; however, a plough-cut edge is much cleaner, and the plough is less apt to crop off excessive amounts of margin. In consequence the plough remained standard for fine work until after World War II, and has gone out of use only because fine work is now so rarely trimmed.